If bonding time is the goal this Father’s Day then hiking is a great way to get that one-on-one time. It can be as simple as taking a walk around the street or taking a hike at a nearby trail. Spending time outdoors and with family is a great way to show your dad that you’re thankful for him. Local Breweries are always a fun and relaxing time. Take Dad to a brewery and let him try all the different varieties they have to offer. Many breweries provide games for guests during each visit. If you have any furry family members, many breweries are pet-friendly and have outside eating and drinking areas. Breweries are also great places to meet new people. Switch it up and you cook him a meal! Growing up, the parents take care of providing food, but now it’s time for a change. After a fun-filled Father’s Day, surprise him by coming home to his favorite meal. If you’re looking to boost the nostalgia, bring out some old photo albums and let him reminisce on the “good ole days”. This one is the priciest of the Top 5, but worth every penny. Concerts are a great way to treat Dad. Do some investigating and find out if any artists that he likes are playing near you. Inviting some of his friends or maybe even some close family members is a great way to take the day to the next level! 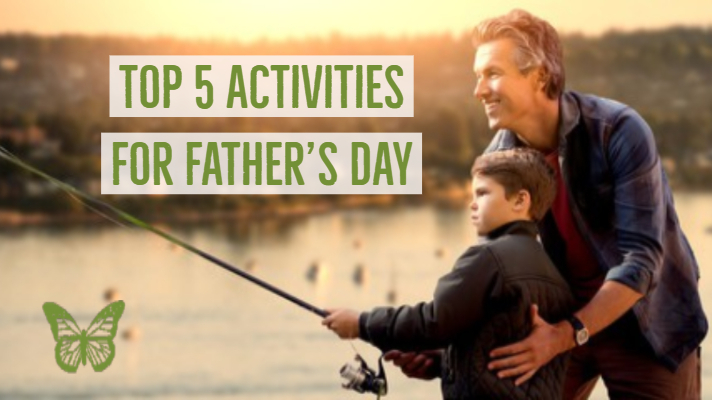 If your dad enjoys fishing, why not take him out on Mobile Bay? Whether you decide to fish from the shore or from a boat, a day on the water is always fun! Pack the cooler and your fishing gear and get ready to create wonderful memories. The best part about Father's Day is spending time together and creating new memories. You can do just that with the list of fun activities above. However you choose to celebrate this special day with your dad, we hope it is the best!